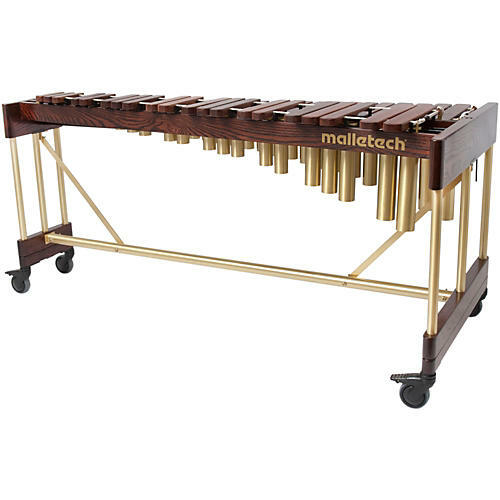 The Malletech XA4.0 4 Octave Xylophone is based on the Leedy model G.H. Green played, but with modern tolerances and quality control, making it the perfect harmony between modern and vintage. The XA 4.0 features a solid honey finish oak and brass frame. The dent resistant rosewood bars are available in octave tuning or the quint tuning used by the classic xylophones of the 20's and 30's. Graduated bars from 2" wide at the low end to 1 5/8" high end. Height adjustment from 34 5/8" (top of the naturals) to 42 5/8". Bars: Graduated from 1 5/8" x 1" to 2" x 1"
Keyboard: Select Honduran rosewood, air-dried for a minimum of 5 years, then kiln-dried.